Just like us, our cats need to be active to stay health. 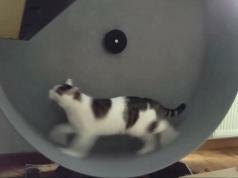 The Little Cat is a connected exercise wheel with auto and manual modes to keep your pets fit. Its companion app lets you control the speed of the wheel. You will be able to learn about your cat’s activities on your phone. Little Cat connects to your devices via Bluetooth and uses LED lights to keep your cats engaged.